Palestinian Authority President Mahmoud Abbas swore in a unity government on Monday, after dealing with a last-minute rift over the issue of a minister for prisoner affairs. The cabinet was sworn in at the Presidential Palace in the West Bank’s Ramallah, in the absence of ministers from Gaza. Three representatives from Hamas were prevented by Israeli authorities from obtaining travel permits to attend the meeting, according to Palestine News Network. The deal follows a last-minute compromise on an issue related to the Prisoners’ Affairs Ministry which had threatened to derail the process. Hamas had insisted on Monday morning that the Prisoners’ Affairs Ministry continue its work, despite Abbas’ plans to dismantle it and start an alternative independent body affiliated to the Palestine Liberation Organisation. The two sides reached agreement on the issue just prior to the swearing in of the new cabinet. The ministry will continue its work, but the matter was not included in the cabinet that was announced today. Abbas announced that the 17 ministers and the Secretary General of the parliament will be politically unaffiliated – the unity government formation follows years of deep political divisions between Fatah and Hamas. In a televised statement, Abbas told reporters that Monday’s announcement marks the end of “the division that has dogged our nation and caused catastrophic harm for the last seven years”. On the question of Israel, Abbas said that the new unity government would not “stand with [their] hands folded in the face of punitive measures”. He said his cabinet would use “every legal and diplomatic tool at our disposal in the international community”. Abbas said that he had received support from many Arab countries for the unity government, as well as from the European Union and Russia. He also mentioned “positive signs” from the United States, which on Monday announced that its concern regarding the inclusion of Hamas in the united government. In a televised statement broadcast from the Gaza Strip, outgoing Prime Minister of Gaza Ismail Haniyeh welcomed the announcement of the government. 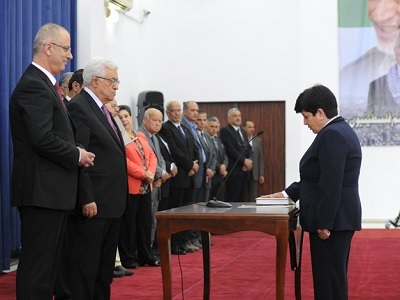 “Today we turn over the reins of government with the Palestinian resistance in good shape”, he said after the swearing-in of the new cabinet in Ramallah. He mentioned that the Hamas bloc had harboured concerns about the reappointment of Riyad al-Maliki as foreign minister for the new cabinet. However, he vowed to co-operate with the unity government, saying that Hamas had worked towards the success of the Hamas-Fatah reconciliation. As was expected, Rami Hamdallah was selected to head the new government. This is the third time he has taken on the role. However, he cast doubt on the ability of the new government to effect change in the long term. “They are being appointed for 6 months, and even the most gifted technocrats need more time to affect significantly realities on the ground,” he said.